This is a fundraiser for a special little girl so that she can have an amazing birthday party. The WINNER will be drawn on 1st May 2018. There are only 350 tickets costing $15 each. Enter as many times as you like. 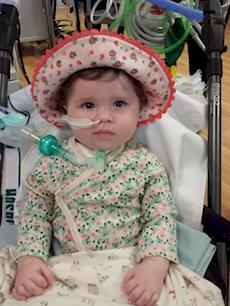 Ana Carolina is currently at Starship hospital and has been there since she was 6 months old. Doctors said she would not live past her 1st birthday. She was born a normal beautiful child. But things went wrong after her vaccinations. Doctors said she would not live past her 1st birthday. But she is still here and is fighting for her life. She is completely paralysed now and eats and breathes with a machine. She has improved a lot now and has started to respond to lots of love and treatments. But everything is very costly. I am doing a little bit to help a little girl to have the best day ever at least once a year! I have been making her cakes since she was 1 year old. Help give Ana Carolina a great party! WIN A BIRTHDAY CAKE WORTH $400 FROM Sugar and Spice Cakes Auckland. Cake prize will need to booked in according to Mel’s availability. Cake must be picked up from our studio kitchen in Lambie drive, Manukau.